I recently started facilitating an experimental new professional development program called Slide Deck Improv, and today I am excited to introduce you to two of partners in crime in this venture, Kristen Rampe and Jason Lieu. 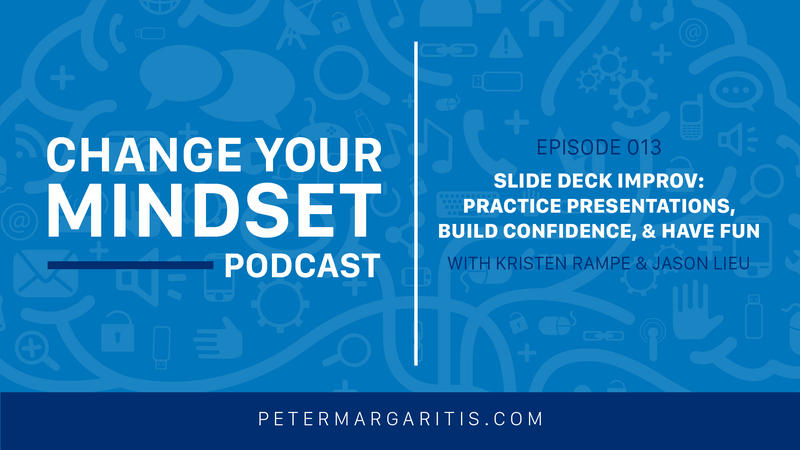 Kristen is the creator of Slide Deck Improv, a 10-year veteran of public accounting, and the owner of Kristen Rampe Consulting. Jason actually worked for Kristen during his short tenure as an accountant, but he left the profession to pursue improv and acting. Now he’s back in the professional services field as a fellow facilitator for Slide Deck Improv. So what is Slide Deck Improv? It’s the most fun way to improve your presentation skills and gain confidence in your abilities, all while practicing the life skill that is improvisation. Slide Deck Improv combines the basic concepts of business communication and improvisation with practical – and fun – hands-on exercises. The groups take part in improv games, culminating in the titular event: people take turns coming onstage, the audience chooses a topic, and then the presenter has to prepare a presentation on that topic using a slide deck they’ve never seen before. In the process, presenters get an opportunity to take a risk in a safe environment, while practicing new communication and storytelling skills. I fell in love with this program the very first time I saw it, and I couldn’t be more excited to be part of it. Because we’re not just teaching business communications skills, we’re teaching everyday life skills. Improv is all about connecting with your audience, no matter who the audience is. It could be your customers, clients, a sales team, family, strangers, whatever – at the end of the day, it comes to people talking to people. And if you can connect with and engage people, you’re going to have this newfound confidence in your abilities. If you want to see Slide Deck Improv firsthand, check out these videos of their past presentations on YouTube. 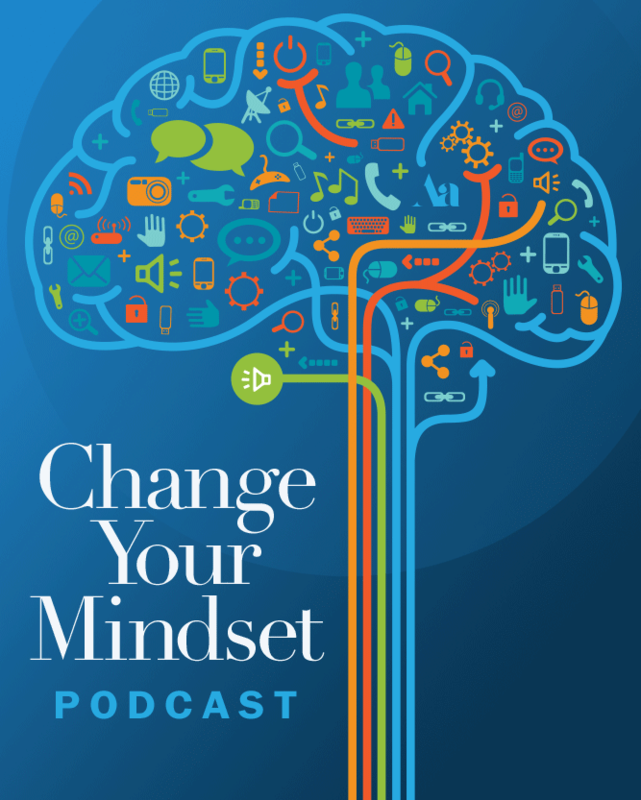 Peter Margaritis: [00:00:45] Kristen, Jason, thank you for being on my podcast. Today, this interview, I’ve been looking forward to ever since we came up with the idea of doing this. I’m so excited about our conversation. One, thank you both for taking time out of your busy schedule. And Jason is out in California. So, he’s kind of up a little bit earlier than normal. So, I appreciate you getting up to be on this podcast. And both of you all, welcome. Kristen Rampe: [00:01:13] Thank you. Good to be here, Peter. Jason Lieu: [00:01:15] Thank you. Actually, I’m in Seattle, Washington. Peter Margaritis: [00:01:19] Oh nice. Actually, that’s the fourth reference to Seattle that I’ve had in three days. Interesting. Maybe I need to go out to Seattle really, really soon. So, let’s start with backgrounds and short bios, so the audience gets to know who you are just a little bit better, and we’ll start with Kristen. Kristen Rampe: [00:01:39] All right. Well, thanks, Peter, for having me back. I don’t remember how long. I feel like we’ve done two of these before, but I’m excited to be here again, especially to talk about improv again today. Kristen Rampe: [00:01:50] So, my background, I started my professional career in public accounting out in California. And I worked in that field for about 10 years, with a quick visit into industry. And then, seven years ago, I stopped working in public accounting and I started my own consulting practice where I bring leadership development workshops and consulting to professional services all across the country. Kristen Rampe: [00:02:18] And more recently, I have sort of developed this really great program that I’m excited to be here with you guys on my team about today called Slide Deck Improv. So, we’re working together on presentation skills, communication skills in business with an improv angle, and it’s really fun. Peter Margaritis: [00:02:38] Yes. I remember when you sent me the email of what was something similar that you found. And I think I jumped straight out of my chair. I got so excited. I said, “This is really, really cool.” So, I can’t wait until the audience gets a great taste of this. But before we start down that path, Jason, out in Seattle. Jason Lieu: [00:02:58] Yeah, I started my career at an accounting firm, actually working for Kristen in California about three years before I jumped ship. It didn’t take me long. Yeah, about two years into it, I asked my brothers to buy me an improv class for my birthday. And after they gave me a lot of good roasting, they did it. It was like an eight-week program, and I just fell in love with it. And I quit my job about two months after. Peter Margaritis: [00:03:34] That’s the epitome of improv. I took an improv class, and I came to my employer and said, “I’m out of here.” And, actually, he had to go tell Kristen that he was leaving the firm. Kristen Rampe: [00:03:44] That’s true, although he didn’t mention improv as the reason why he was leaving. It’s good to hear that that’s what it was. Peter Margaritis: [00:03:51] Jason, so, what was it that you saw that made you interested in having your brothers buy this for you? Jason Lieu: [00:04:00] I just needed a creative outlet, I think. I’m a deeply analytical person. I think, most professionals are. So, I spend a lot of time in my head. I just wanted something that was unpredictable and a little bit more in the moment. Jason Lieu: [00:04:26] Yeah, when — In any given moment, I’m in my head trying to digest information. And I like to go back and analyze everything before I come up with an answer. Improv gave me this tool that allowed me to live in the moment, listen to people, and to actually engage in real time, and I just love the feeling and energy of it. Peter Margaritis: [00:04:55] Yeah, it is a great feeling when we’re able to do that, and that you saw the light. And just so the audience knows, please correct me if I’m wrong, since that time, you have also done some acting as well. Jason Lieu: [00:05:10] Yeah. Yeah, I did improv for a little bit. And then, when I quit my job, I took a part time job doing just accounting services while taking accounting classes at night. I mean, while taking acting classes at night. After about a year, I actually made the move to LA, and went to the big improv class at UCB. I went through their Foundational Improv Program as well. Peter Margaritis: [00:05:41] Oh, man. God. If I was your age again, I would do the exact same thing. I think, it’s a great skill set in life. And, actually, I’m trying to get my 18-year-old son to maybe take a gap year before going to college. I told him I’d pay for it. I’d send him to Second City in Chicago for a year and just let him study on my dime. But I’m dad, and I’m an idiot. So, what do I know? But it is a great skill set to have. Jason Lieu: [00:06:07] Yes. He’ll have his quarter-life crisis. Don’t worry. Peter Margaritis: [00:06:16] Yeah. Don’t we all at some point in time? All right. So, my question is, and I’ll point it to you, Kristen, what is Slide Deck Improv, and where did you come up with this idea? Kristen Rampe: [00:06:31] Yeah. So, I’m going to start with where the idea came from. I was talking with some people that I know locally where I live in Michigan. And one gal asked if I would be a part of this event they wanted to host where they were going to have people come onstage and present with a PowerPoint presentation that they’d never seen before. And I thought, “Wow, that sounds kind of different and interesting. And I’ve never heard of it,” but I didn’t really know the group, the networking group, that was hosting this. I didn’t know them that well, and I wasn’t sure if I wanted to do it. Kristen Rampe: [00:07:40] So, we agreed to that. And it worked out really well because I was able to bring some, you know, kind of wrap new event with, you know, not formality in a stiff way but kind of getting things in line, so it would be a good event for their audience. And we just, collectively, the whole team, that was ACG West Michigan group, we knocked it out of the park. Kristen Rampe: [00:07:59] And so, the idea came from them. Someone on their board committee had suggested it. And then, I kind of looked it up and, again, put some structure around it, so there’d be a little bit of learning, a little bit of practice, and just a whole lot of fun. Kristen Rampe: [00:08:12] So, what Slide Deck Improv is, is professional development or learning program. And it could come in the format of either a sort of an event with a speaker or, for a smaller group, it’s like the classroom learning program. And we talk about public speaking. We talk about business communication. We tap it into some improv concepts. Kristen Rampe: [00:08:35] Most importantly, we play some improv games, which is really fun with a whole audience. And then, the real cornerstone of it is we do get people to come onstage. We choose a topic from the audience that nobody knows until we figure out what the topic is. We give them a slide deck with a handful of slides they’ve never seen before, and give them 45 minutes, and then let them go to town. Kristen Rampe: [00:08:58] And it’s great fun to see professionals think on their feet where they ordinarily would not, you know, have the opportunity to do that. Sort of what Jason was saying that, you know, most professionals really spend their time in analytical places problem solving, working the details, working hard, and not a lot of opportunities for creative expression at work, but presenting is one of them that’s fun to give them a new way to do that. Peter Margaritis: [00:09:24] It almost is like when we’re giving the professional group out there a little arch education in the sense of a problem solving on our feet, and actually taking our knowledge that we don’t know that we have what we have and apply it to the situation at hand in order to make some type of success. Peter Margaritis: [00:09:46] And you had sent me a video that, I think, that you saw that when I saw it, oh my god, this looks like it’d be — It really looks like I have no net. And, for me, that was exciting. For many, it will be petrifying. But there’s so many benefits from doing this. And, Jason, would you mind sharing some of the benefits and takeaways that you’ve seen when you’ve facilitated with Kristen from the audience on their big aha moments? Jason Lieu: [00:10:18] I think one of the beautiful things about improv is that it shows you what you actually do know and what you actually have internalized to have a little bit more faith in your abilities to not feel so insecure in a public realm. I think a lot of us feel like we can’t do it, we don’t know how to do it. We don’t trust our instincts. I think this opens up a whole new realm for people. Jason Lieu: [00:10:52] I think a lot of people with the “yes and” to accept what people are giving you and to build on it is a great listening technique. People don’t get taught how to listen. I think thinking on your feet, as well showing that — Not an idea. Kristen Rampe: [00:11:12] Like I did right now. Jason Lieu: [00:11:24] What about you, Kristen? Peter Margaritis: [00:11:24] It’s okay, man. All good. Kristen Rampe: [00:11:24] Yeah. You know, I think those are great points. I saw in the last couple of times that I’ve done this recently, you know, that confidence piece come out in unexpected ways. And, also, the storytelling part of it, a lot of the technical work that people do, it just seems like it doesn’t lend itself to a story. You know, it lends itself to a spreadsheet or a bulleted list of information. Kristen Rampe: [00:11:50] But when the participants step back and take a moment to think about, “Okay. Now, I have to tell a story about this.” And, you know, the classroom workshops where we have more time for people to get into a story that’s relevant to their work, they can find it. And we can find interesting pictures that can connect what’s important about their message or what they’re trying to persuade people to try, so that it works. It’s more effective for them in terms of their communication. Kristen Rampe: [00:12:20] So, a lot of other cool benefits in the confidence area and the storytelling area. And, as Jason said, even just giving yourself a chance to think on your feet and be vulnerable. Peter Margaritis: [00:12:30] So, let’s talk about confidence. Most people are not very confident about standing in front of a room full of people and delivering anything. My question is the participants that have done this and, you know, follow that fear, and accept the “Yes and” in the moment, do you feel like their confidence level has quadrupled or doubled from like doing a normal type of presentation? Do you think they find more confidence in themselves by, “I just did something really hard. And it wasn’t — I did it well. I mean, I did it. It wasn’t perfect but that’s okay”? Kristen Rampe: [00:13:08] Yeah. I would say that’s a definite boost people get as a result. In terms of the multiply, I’m not exactly sure. And I do think it gets stronger, in some ways, the further out they get from the moment of finishing because, as you said, it doesn’t — You know, most people don’t end it and say, “Oh, man. That was the best presentation I’ve ever given” because to them, the best presentations they’ve ever given is one that’s scripted, and prepared, and on point, and relates to their knowledge base. And this was totally not that. Kristen Rampe: [00:14:11] Yesterday, it was a group of young professionals, and none of — not none of them, but each person probably only knew two or three other people in the room of 40 or 45. So, for the most part, it was strangers. So, I’ve got this one gal. She was in like the internal audit group. And she got up there, and presented to all these people she didn’t know, and did a great job talking through her slides. And you could just tell, that wasn’t something she had done before. So, that inherently boosted her confidence, you know, after she got to digest like, “I just did that.” It was great. Peter Margaritis: [00:14:44] So, you guys deliver this, or, I guess, I could include myself in that aspect of it, to not just CPAs and financial professionals, but it also applies to other industries, other facets. And, to me, it sounds like that young professionals just eat this thing up. Kristen Rampe: [00:15:04] Yeah, young professionals group, sales groups, you know, a lot of those people who fall into that sort of category of, “It’s not my job to be speaking all the time or is a big part of what I do, but I do have to do it sometimes.” Yesterday, I had some engineers come up to me afterwards and say, “How do I — I feel like I have all this technical information that I need to share. I have lots of data that needs to be shared. What can I do about that?” And we talked through how you can maybe change up what’s really needs to live on your slides and what doesn’t. So, it’s applicable to so many different groups of people. Jason Lieu: [00:15:46] Yeah. I love improv because it’s such a general skill. It’s not just a business communications skill. It’s a life skill. You know, you can bring this into all your facets of everyday life. And it’s all about connecting with your audience no matter who the audience is. It could be your customers, clients, a sales team, internal, external, whatever. At the end of the day, it comes to people talking to people. And if you can connect and engage people, you’re going to have this newfound confidence in your work. Peter Margaritis: [00:17:17] Right now, well, the three of us have presented to an audience of three and however many the other two people that are listening to this podcast, the other thousands of folks who are listening at this time, but some folks just freeze up at that point. They don’t have that confidence. And SDI seems to help in building at a much rapid rate. Now, I know you guys did a big thing for the Iowa Society of CPAs about a month or so ago. Is that correct? Peter Margaritis: [00:17:49] And could you tell the audience what you did for them, and the outcomes, and the takeaways that that group went away with? Kristen Rampe: [00:17:56] Sure. So, we were out there as part of an emerging leaders conference. That dovetail with the young professionals group again. And with slide deck improv, we had a short segment that covered the improv concepts and some improv games. So, some of the takeaways everyone got to experience was some getting comfortable with the uncomfortable pieces, which I think really helps with that confidence part because, a lot of times, they feel unconfident because we’re going into a situation that’s uncomfortable. And then, when we give them fun, sort of safe places to fail, it helps with that. Kristen Rampe: [00:18:59] And it’s interesting seeing different people’s approaches We have one guy who is really kind of cool, and just sort of talking to his points, and wanting to make a point of having people be kind to them because it was his birthday. I thought that was very cool. It was a birthday. And then, we had one gal who got up there, and she had to talk about printers and copiers. And she just rocked it with all the different images. So, it was a good event, and I think they all enjoyed being up there. Jason, anything from your perspective? Jason Lieu: [00:19:29] I love that after we were done presenting, another person came up, and asked if they can do it, you know, without a crowd because he’s just really wanting to get into it. Just showed that it was connecting with people, and they really are having a lot of fun doing it. Kristen Rampe: [00:19:47] Yeah, I’m glad you brought that up because I think I was — I even told that story yesterday too. He was so — He wanted to do it so badly that he was willing to. I mean, it was a lunch break next. And we didn’t have time to add another presenter, so we did the lunch break. And he said, “Can I just do it right now?” So, I think, Jason, it was you, and me, and like one or two other people in the room, and this guy standing up doing his presentation. It was great. Good point. Jason Lieu: [00:20:12] He rocked it. Peter Margaritis: [00:20:12] But his fear was doing it in front of other people, it sounds like, or maybe did he wait and didn’t volunteer quickly enough? Kristen Rampe: [00:20:23] No, we didn’t have time to add him in. He would have loved to have been on the stage. Kristen Rampe: [00:20:28] But I think what stood out was his enthusiasm to do it. Like he wasn’t going to let the fact that there was no crowd stop him from doing that. Peter Margaritis: [00:20:37] Actually, that’s cool. I mean, it is energizing in so many ways. And to have an audience member go, “I don’t care. I just want to try it. I just want to do it. I don’t care who’s around.” But that shows the power of this stuff. Peter Margaritis: [00:20:52] I did it. I was in South Carolina, at the South Carolina Association of CPAs. We were doing a two and a half day train the trainer. We train the discussion leader to be more engaging. And we had some time when we were finished, and I said, “Would you like to try this?” And they said, “Sure, Pete. You can try this.” I said, “Okay, I’ll start off. and I’ll do it.” And I had asked prior to that one of the staff members to come up with some slides that make two decks in case get somebody else up there. Peter Margaritis: [00:21:48] And another guy says, “I’ve done improv way back. Can I do it next?” and got up. Basically, at the end of the day, everybody in that room went, “This is a great training tool.” And anything got to do with presentation skills because of that confidence, that fear, that trust. You know, it was really, really cool. So, you guys up for some improv? Peter Margaritis: [00:22:19] Jason’s laughing. So, what we’re going to do, we’re going to try this. And I’ve created a four-slide PowerPoint presentation with just a picture on each slide. And they have not seen it. We have not talked about it beforehand. And I was going to ask them to give me a topic, but then I was watching this real cool video of Kristen as she was practicing. And I didn’t know there was a website that would just generate random words. Peter Margaritis: [00:22:50] So, I found a random more generator. I’m going to generate the word. And then, I’ll put up the slide deck. And then, I’ll share my screen with you. And then, Kristen, you start off when you see the slide. And when you’re done with that slide, I’ll click. I’ll change it. And then, Jason’s going to take the next slide, and kind of follow that thought process per se of Kristen’s and see if we can get through all four slides going back and forth. Jason Lieu: [00:23:30] If you want to trade places, I’m okay. Peter Margaritis: [00:23:34] I don’t think I’d get there quickly enough. So, we’re going to try this. And hold on a second. Let me do a couple of things. Kristen Rampe: [00:23:52] … your podcast people aren’t going to get with it. Peter Margaritis: [00:23:54] Yes. If you can describe the image and then start. Then, Jason, if you describe the image real quickly, and then pick it up from there. Yes. And Cody, you can cut that piece out, Ben, whoever is doing the editing on this, that little instructional piece out. So, I think I have to share my screen first before I can — So, don’t look at this. Close your eyes, everybody. Kristen Rampe: [00:24:20] All right. My eyes are closed. Peter Margaritis: [00:24:22] Okay. Can you guys see my screen? Peter Margaritis: [00:24:28] My messy desktop here. Okay. So, open your eyes. Oh, I can’t go back to the word generator. I forgot to get the topic. Don’t look at that. So, Cody, you can — Ben, you guys can do some editing during this piece. Let’s see. Random word generator comes up with friends. Peter Margaritis: [00:24:59] The topic is friends. This will be interesting. All right. So, let’s go full screen. Kristen, are you ready? Kristen Rampe: [00:25:11] I’m ready. Peter Margaritis: [00:25:13] Okay, one, two, three. Kristen Rampe: [00:25:17] All right, everybody. I’m really excited to talk to you today about friends. And I want to describe to you the image that I have in front of me, so you know what I’m seeing. It’s basically a bank of power meters, like the old school kinds that have the kilowatt hours, and all the little dials on top, and the red thing that spins around. And when you get your air conditioning on, you go outside and look at it, it’s going really fast. Kristen Rampe: [00:26:03] And, ultimately, the meter reader is not necessarily the kind of person I would call a friend, but anybody else who’s in my backyard is definitely a friend. So, if you ever find yourself in my backyard, whether you’re looking at the meter reader — the meter itself, you’re probably a friend of mine, meter readers aside. So, that’s just the first thing that’s important to say as it relates to friend. And, now, I’m going to pass this on to my friend, Jason, who’s going to continue this concept. Jason Lieu: [00:26:36] Thank you, Kristen. Here, you have an image of a kayaker kayaking into the horizon. Obviously, you could do all sorts of things with your friends. Kayaking is one of my favorite pastimes. Usually, you require two people. One person’s in front to steer. The other person in the back is for the power. It might be the other way around actually. But it’s important to have friends to have these activities because getting out and knowing that you’re not alone in the world is beneficial to your soul and to your well-being. Okay. Kristen Rampe: [00:27:23] There is another picture you really wish you were seeing right now, which is a guy in free fall on a skydive. So, his parachute hasn’t opened yet. And he’s got a big smile on his face and a whole parachute getup. And he is the guy who’s parachuting down to land at the site at which he’s going to go kayaking later this afternoon. And if this guy were my friend, and he probably should be, I would totally be skydiving with him. I would be attached to the tandem dive master because I don’t really have any skydiving skills of my own, but I’m really good at being strapped into a harness. Kristen Rampe: [00:28:02] And that too, let’s bring this back to power and friends. It’s really powerful to be falling through the sky at whatever meters per second things fall that I learned one time in physics class. And a great way to build a friendship is to do something really dangerous together or really scary. So, skydiving before or after the kayaking with your friend who’s cool to be in the backyard who’s not the meter reader, and that would be one way to do it. Kristen Rampe: [00:28:30] And, you know, I mean, just even the view you get from here is that sort of awe inspiring that you and your friend, when you skydive together, can take with you for the rest of your life. Click. Jason Lieu: [00:28:45] Here’s an image of that empty stage. It’s a beautiful image. It depicts how lonely it can be when you’re the only person in the spotlight. Friendship is about sharing. It’s sharing the spotlight with everyone. If you’re out there alone performing for a group of people, they’re just strangers. You really want to invite everyone on stage because everyone has an equal part in your life. And that’s what all friendships are about. Thank you. Peter Margaritis: [00:29:26] I’m trying to hold back the laughter. You guys are good. I mean — And so, I just grabbed some. And when it came up friends, I started thinking about the slides. I went, “Oh, I’m not sure how they’re going to do this,” but that is Slide Deck Improv without a true net with two people that I don’t think that’s ever been done before in the Slide Deck Improv era. But you guys just knocked it out of the park. Peter Margaritis: [00:29:55] I hope my audience can appreciate that this is — And you could tell. You could tell by the tone of the voice and what they were saying, they’ve never seen this stuff before, and they were drawing upon their knowledge accepting the picture, leaning forward, following that fear, and absolutely nailed it. Great job, guys. Wow. Kristen Rampe: [00:30:16] Thank you. Thank you, Jason, for being a good partner in crime there. That was great. Peter Margaritis: [00:30:22] That was. That was really, really. That was really great. And beforehand, we were talking about doing this because I didn’t want to just completely throw it at them and doing the tandem, and what did both of them do? “Let’s give it a shot. Never been done before, but let’s give it a shot.” And that’s all about improv. Peter Margaritis: [00:30:44] Guys, I can’t thank you enough for putting yourself out there and talking about this new venture that we are doing. Kristen, I am so glad that I met you. Somebody introduced us together because — I feel like the three of us are on the island of the accidental accountants. It’s kind of like the misfit world, but it is a little bit different. It’s probably the island of improv because it’s all accepting, and this is really an exciting teaching tool that applies to everybody. Peter Margaritis: [00:31:27] And if you want to have your career continue to grow, embrace improv, and better yet, embrace a session of Slide Deck Improv. And before I let you guys go, I know that — Kristen, if you could tell the website. I know that you’ve got some videos out there. I know that you’ve been posting a lot on social media to get people to follow. Give us all that great information, so people can find us. Kristen Rampe: [00:31:54] Yeah. So, I’ll do the website piece, and I’ll let Jason do the rest. So, if you go to SlideDeckImprov.com, as simple as it sounds or search it on the web, you’ll find information on the programs. You’ll find bios on myself, and Peter, and Jason, and some of the other people that support us in this program. Also, some ways you can get in touch with us if you’re interested in maybe getting an outline about a program or seeing if we have availability to facilitate an event for you. Kristen Rampe: [00:32:25] We’re also working on a DIY kit. So, if you have a particularly small budget, and want to try to do this yourself in-house, we’ll set you up with the materials you need to have a fun program at a good price. So, a couple of different options there. And then, Jason, you could tell them all the many, many places to find us on social media. Jason Lieu: [00:32:45] Yeah. You can find us on Twitter, YouTube, Instagram, Facebook, @SlideDeckImprov. Just google it. Subscribe, like, follow. You can find — We post a lot of articles about communication, leadership skills, tips, loads of fun things. On YouTube, you can find some short clips about –You can find some short clips of our past presentations that you might find quite funny actually. So, find us and get in touch. Peter Margaritis: [00:33:21] Yeah. Speaking of short clips they might find funny, I love the one that you guys did, the video of the group, and the guy happened to be a CPA, and his topic was botany. Peter Margaritis: [00:33:32] I watched it. Every time I watch it, even though I’ve seen it, he was really, really good, and made me laugh. But, man, that was really powerful stuff. Peter Margaritis: [00:33:42] So, guys, thank you so very much for taking time out. I look forward. Kristen, I’m going to see you in less than 10 days, I believe. I’m coming to Grand Rapids for the event that you have lined up. And I’m looking forward to doing that with you. Hopefully, Jason, our paths will cross. Apparently, I need to come out to Seattle. So, maybe I’ll just take a trip, and come out, and visit for a while, and then come back. But it’s been a pleasure. Peter Margaritis: [00:34:08] Personally, I think the three of us could probably talk for hours on improv. And we have. But we’ll give the audience a little rest. But for those of you who are listening, just think about what we discussed. Come out and find us. Read this stuff and contact us. We’re here to help, and guide, and help you guys become better in the business world. So, thank you all very much, and we’ll see you on the next episode.